Ensure your food cooks over open flames while remaining a good distance away from them using the Rome Extension Roasting Fork. The classic shape and lasting construction will make this unit a favorite tool for all your outdoor cooking, while its innovative, expandable feature helps kids stay safe. Two, 2.5" long metal tines easily spear a hot dog or mett, and the chrome plated steel heats quickly and evenly. The shaft extends up to 23" long, and telescopes into itself for convenient transportation and storage. A flared section of the shaft acts as a lock, stopping the fork from coming apart or sliding down during use. The 4.75" long, wooden handle adds a bit of insulation, and its rounded shape makes holding the unit comfortable. 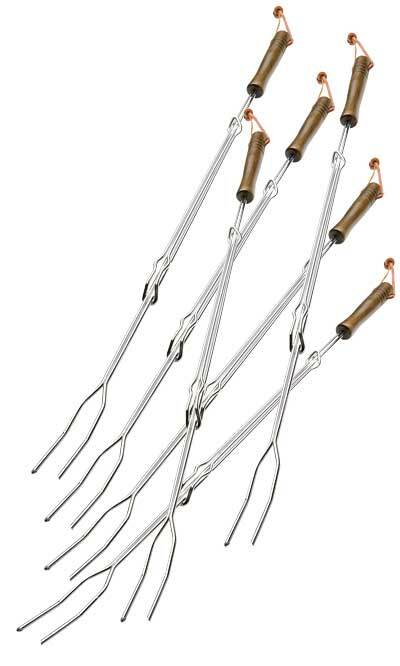 Safely cook over a fire with help from this Extension Roasting Fork. Note: This case pack includes 6 of the Rome Extension Roasting Forks.